Jackson speaks out on racial inequality. 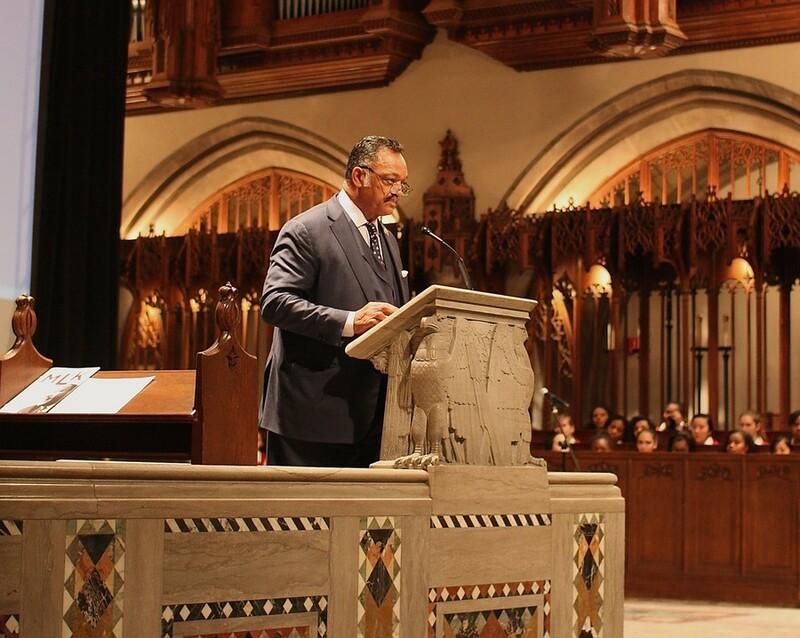 Focusing on his relationship with his good friend and colleague Martin Luther King, Jr., the Reverend Jesse Jackson Sr. headlined the University’s 25th annual Martin Luther King Day celebration in Rockefeller Chapel, where King himself once spoke. Jackson, a civil rights activist and leader, founded the Rainbow PUSH Coalition to advocate for empowerment, peace, equality, and socioeconomic justice. He is a recipient of the Presidential Medal of Freedom and worked closely with King and other civil rights leaders in the past. King gave speeches at the University of Chicago twice in his life, and Rockefeller Chapel was the site of his first major speech in the city of Chicago. At the end of his life King even penned a letter to the head of the Chapel at the time stating his desire to return to Rockefeller soon, but he was unable to before his assassination. Jackson focused on the city of Chicago in his speech. He lamented the closing of businesses across the South Side, repeatedly mentioning the large number of grocery and drug stores that have been shut down. He also focused on educational disparity in the city, discussing the 50 public schools that have closed in the area. He compared the plight of black students to an unfair football game, noting that while in football everyone plays by the same rules, it would be a different game if it went by the same rules of the current system in America. “If blacks had to go 12 yards for a first down and whites had to run eight yards, it wouldn’t be a fair game,” Jackson said. Jackson went on to question why schools with vastly different levels of resources were taking the same tests, noting that students from the South Side are at a clear disadvantage when it comes to college admissions. He also pointed out that the way resources are distributed among the local schools is consistently unfair. “Not by race; by resources they enact legal segregation. One school is high, one school is low…[King] would be disappointed,” Jackson said. When asked how the average student can make a difference, Jackson emphasized the need for broader access to education. “The first thing you can do is try to make education more affordable,” he said. He also described how the high levels of tuition across the country are restricting educational opportunities for students who may not be able to cope with the costs of college in 2015. “The fight to make education more affordable is a good one,” Jackson said. Another consistent theme throughout his speech was that while the youth of today need to continue the fight of his and King’s generation, they also need to make their opinions heard by voting. He described speaking to teenagers in Ferguson, Missouri and the importance of encouraging youth to exercise their right to vote. “You have to use your strengths to make a decision about the multiple options you are given,” he said. Ernest Green, the eldest member of the group of black students who tried to integrate Central High School in Little Rock, Arkansas in 1957, spoke prior to Jackson’s speech. His son Adam Green, the master of the Social Sciences Division in the College, led a Q&A session with him regarding King’s work and the drive for equality. Ernest Green was adamant that current civil rights movements need direction and support to make real change. “It can’t be a leaderless movement. It needs focus; it needs resources,” he said. In a similar vein, at the end of his speech, Jackson implored students to come together regardless of race or religion and make a change as a group. “Make multicultural connections and learn how different people can make a difference,” Jackson said.